...for every gallon of gas pumped, the oil companies make 8 cents. For that same gallon, the US government takes in about 56 cents. Which is the bigger problem here? That fat slob in the picture is reaping record profits simply because we are using record amounts of fuel. Notice that I didn't make any mention of oil companies' record profits in this post. I'm not accusing the oil companies of price gouging or anything like that. ...my beef with Mr. Raymond is that he has consistently worked to deny and disprove global climate change and confuse and stop any efforts to invest in combatting the threat of global warming. 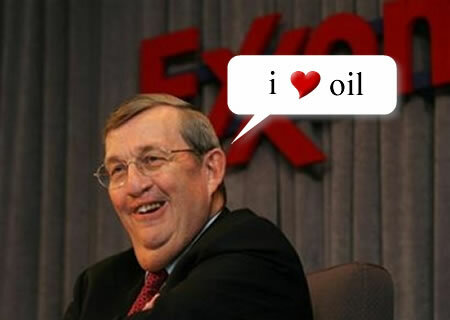 He has also consistently claimed that world reserves of oil are FAR higher than anyone else is claiming and while leading Exxon-Mobile, had the destinction of being the ONLY major oil company who refused to diversify their energy holdings into anything but oil and gas. And now this man is apparently helping the Bush Administration craft our energy policies! A man who has denied to two key threats/problems that must be addressed by any forward thinking and sound energy policy - climate change and peak oil/resource depletion - is going to lead us into the future!